As I’v become older, I have found that my ability to hear certain sounds has diminished. Even worse, I find it hard to pick up individual voices when there are several people talking or when there are other sounds. This makes it hard for me to carry on a conversation in the midst of a group or even on the telephone is there is background noise. Most of us have similar problems when it comes to our spiritual lives. We have so many things clamoring for our attention. Concern for our relationship with our spouse, our children, our job, our home, our retirement, our health, and a myriad of other things all make a claim for our attention–and rightly so. All of these things are important and require prayer and action on our part. When Isaiah felt beaten down by circumstances, he sought God. And God told him, Go out and stand before me on the mountain. And as Elijah stood there, the Lord passed by, and a mighty windstorm hit the mountain. It was such a terrible blast that the rocks were torn loose, but the Lord was not in the wind. After the wind there was an earthquake, but the Lord was not in the earthquake. And after the earthquake there was a fire, but the Lord was not in the fire. And after the fire there was the sound of a gentle whisper. When Elijah heard it, he wrapped his face in his cloak and went out and stood at the entrance of the cave. (I Kings 19:11-13) Then, God told him what to do. Later, he told the people, Though the Lord gave you adversity for food and suffering for drink, He will still be with you to teach you. You will see your teacher with your own eyes. Your own ears will hear him. Right behind you a voice will say, “This is the way you should go,” whether to the right or to the left. (Isaiah 30:20-21) Winston Churchill once said, If you’re going through hell, keep going. Don’t get hung up on the troubles and concerns of this life. 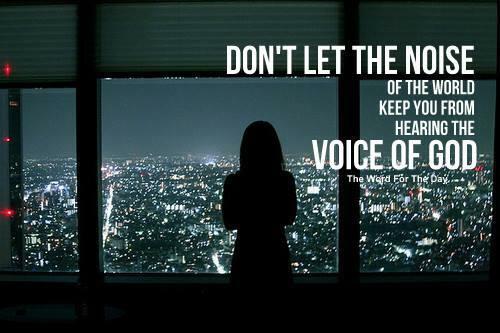 Tune out the noise of this life. Listen to the still small voice that’s right at your shoulder, telling you which way to go. He’s always there and He’s never wrong. I love this KEn! We really need to focus on the quiet times because the world is loud and God does whisper.